Christmas came early for us this year! 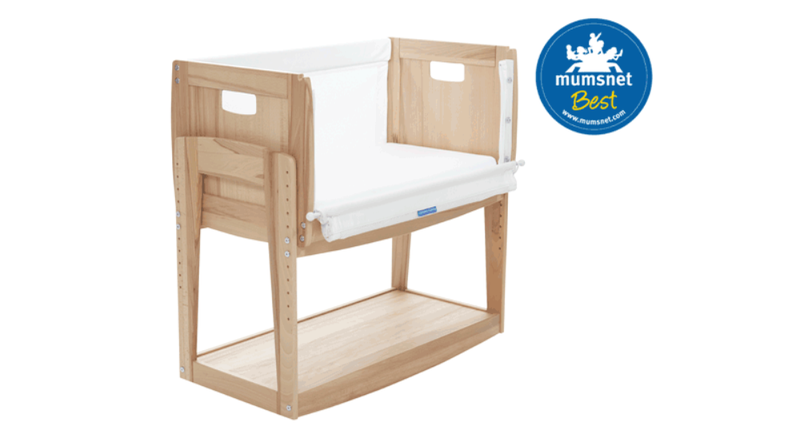 Mumsnet just awarded the Huddle Bedside crib Best Newborn Bed for Longevity 2017. This is a real honour for us as the Mumsnet review team are very strict about who they give awards too. We had no worries about comfort in this crib – the mattress was soft and the baby loved snuggling into it. The crib has 10 height settings and can be adjusted to slide in perfectly next to pretty much any bed, up to a maximum mattress height of 70cm – one of the highest out there. This is especially good if you’re breastfeeding, as having your baby within arm’s reach makes a huge difference to the ease of night feeds. It’s also always nice to be able to see your baby through the mesh paneling without even having to raise your head. The detachable crib means your baby can be brought to nap in any room in the house, so you can keep her close by as you get on with your day. The neutral colour options mean it blends into most rooms. It’s really easy to put the side up and down in the night, and it looks great, too. It’s of the highest quality, it looks great and we found it super easy to assemble. Reasonably priced at £220 (the mattress will cost an extra £30) this is an option that will last longer than just a few months. The Knuma 4-in-1 Bedside Crib has the potential to become a modern classic in the baby market and for very good reason.